Recently, Steve and I were in Thailand leading a deeper life retreat with our Asia Pacific team. One afternoon, I sat out on the back deck, surrounded by tropical beauty, sipping coffee and reflecting with a friend on our ministry lives. Paula shared with me the story of how she and her husband Ty left their career and home, sold everything, and headed for the field. Since they started with our organization, they have lived in at least four different countries. I asked Paula how she coped with all the changes, and her thoughts were profound. Paula has developed a deep trust in Jesus Christ as her shepherd and believes that where He leads she will follow. She is completely surrendered to Him. At times change has been hard, but she believes everything she has in Jesus is enough. As His follower, she has given up any sense of entitlement: her right to own one forever home, her right to security and stability, and her right to live near family. Have there been hard times? Oh you bet! But because Paula completely trusts her Shepherd, she’s able to navigate transitions with grace. I found my conversation with Paula refreshing ad inspiring. Her story reminded me of Psalm 23:3 and 6, “He guides me along the right paths for His name’s sake . . . Surely Your goodness and love will follow me all the days of my life.” As her Shepherd, Jesus has guided Paula through every transition, and His goodness and love have held her secure. Seasons of transition are challenging for me, and I’m guessing they are for you too. Understand—I’m not saying we can’t grieve the losses that come with change. Certainly it’s healthy to grieve those losses, but then we must be willing to put our hands in the Good Shepherd’s and follow. Only then can we experience the fullness of the abundant life He promised (John 10:10). The Shepherd is good, and His intentions towards you are good. 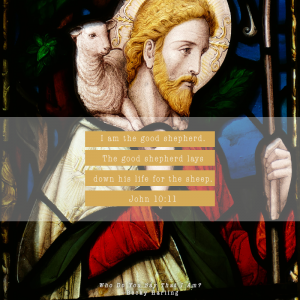 Jesus reminded us that He is “The Good Shepherd” (John 10:11). Sometimes in seasons of transition we become fearful that the future is going to be bad. Even if the Shepherd allows difficulty in your life, you can trust Him. He promises to bring good even out of evil as you trust Him. (Romans 8:28). The Shepherd will guide you in the right paths. God’s primary agenda in your life and mine is our transformation into the image of His Son, Jesus Christ. As our Shepherd, Jesus will lead us in the right paths for this to occur. (Psalm 23:3). He knows what you need during transition, and He will provide it. The Shepherd’s presence will be with you during seasons of transition. Fear is our natural response when life feels out of control, but knowing that God’s presence is with us brings comfort and reassurance. David, the writer of Psalm 23, wrote, “I will fear no evil, for you are with me; your rod and staff comfort me.” David knew that if the presence of God was with Him, He could face any enemy or any difficulty. Friend, the same holds true for you and me. No matter what you face tomorrow, the Shepherd will be with you! For more songs to prompt your praise, check out the playlist for Who Do You Say That I Am?, my new Bible Study releasing tomorrow! !